The Only Ten Rules a Writer Needs. I came across the following list on one of my social media sites, and you know what? This is the most perfect list of writing rules I’ve ever seen. I don’t know how many published writers who really, REALLY need to read this list! My comments are in red. 1. Never open a book with weather. This one should be obvious. Unless you’re writing a parody. 2. Avoid prologues. I have used prologues. I think there are a few occasions when they are necessary. But I think most of the time they are used as either info dumps or a way of hooking the reader when your first chapter isn’t strong enough to do that on its own. (Maybe because you started that first chapter with the weather?) Re-writing the first chapter is usually the better option. 3. Never use a verb other than “said” to carry dialogue. I think you could get away with using “asked” now and again – if the character is questioning someone. Otherwise, please don’t. Please. I hate this practice. 4. Never use an adverb to modify the verb “said”…he admonished gravely. A sure sign of sloppy writing. 5. Keep your exclamation points under control. You are allowed no more than two or three per 100,000 words of prose. Unless I’m on some social media site (in which case exclamation points are mandatory) I find it so difficult to use one of these in my writing. On the rare occasion I do use one, I normally end up going back and taking it out, because just knowing it is there disturbs my peace of mind. They are just so amateurish. 6. Never use the words “suddenly” or “all hell broke loose.” Okay, I am guilty of using ‘suddenly’. But I’m rapidly getting to the point where it bothers me nearly as much as an exclamation point, so I expect soon I won’t be able to use it at all. 8. Avoid detailed descriptions of characters. I hate reading them, and I don’t like writing them, so this one is easy. 9. Don’t go into great detail describing places and things. The best descriptions are short, simply and perfect. And astonishingly difficult to do well. In my own writing, I’ve been struggling with Breathing Ghosts, my time travel novel. I have to introduce two new characters in this current chapter, and a new plot point. The first character I’m writing is difficult simply because she is Molly’s mother, and Molly (my main character) doesn’t get on with her mother. In fact, she doesn’t want to talk to her, talk about her, or even think about her – and this makes it really hard for me, because everything I know about Breathing Ghosts is filtered through Molly’s knowledge and perspective. I’ve said before that I have no choice about being a writer. I write because I have to write, because otherwise my head would be so packed full of other people’s lives that I’d have no room in there for my own. Most of the time when I’m writing, it’s the easiest, most natural thing in the world, because it feels exactly as though these imaginary characters of mine are real, and they are dictating their lives to me. Writing surprises me and delights me, and I don’t understand at all how it works, only how it feels. But every so often, writing frustrates the heck out of me. And this chapter was one of those times. Molly did not want to tell me anything about who her mother actually was, and every time I tried to muscle through and write something, it was always wrong. For me, writer’s block is simply the Othermind’s way of telling me: You’ve got this wrong. I’ve taken a wrong turn and the only way to fix it, is to delete everything up to the last point when the story was going well, and rewrite from there. On this chapter, I lost track of how many pages about Molly’s mother I wrote, then deleted. And what made it worse, was that Molly’s mother had the important job of introducing a secondary character, and raising a new plot point. First I wrote the secondary character (SD) as a man named James. And that was very wrong. So SD became Katherine. And Molly and she had a face to face meeting that was one of the loveliest bits of writing I’ve done. I really, really liked it. But it was wrong. So…I deleted that, although it hurt. Then Katherine was only spoken of, but that wasn’t right either. Finally, Katherine ended up being dead, and I think she’ll stay there; the chapter finally feels right. Alas, poor Katherine. So, I think the chapter’s finally working out, which is good, because I don’t want to struggle with this book. I’ve put a lot of me into this book; Molly is closer to being me than any other character I’ve ever written. I’m not sure how or why that happened, but it’s…interesting to write. Anyway, I didn’t intent to unload all this introspection when I sat down to post Leonard’s Rules, but…there it is. All the crazy. One of my writing works-in-progress is a time travel novel called Breathing Ghosts. It’s interesting writing it, because I’m getting to explore my real, actual beliefs regarding time travel – and time itself. I’m an Eternalist. I believe that time is a dimension, the same as space is a dimension, and that all points of time (the past, present, and future) exist simultaneously. Theoretically, according to Einstein’s Law of Relativity, this makes time travel possible. The only catch is that, this also makes time travel fairly pointless – if the whole reason you want to time travel at all is to change something from your past. I’ll talk about that later; first I want to explain time as a dimension. Everyone accepts that space is a dimension, and that all points of space exist together, and simultaneously. The fact that you might be living in New York doesn’t mean that Cairo, Russia, and Milwaukee don’t exist. You can’t see or experience those cities from your New York apartment, but if you hopped a plane, you could change your location to wherever you wanted to be. If time is a dimension, then all moments in time exist at the same “moment” – no matter whether you can see or experience any other moment but the one you’re experiencing now. The day you are born (Paris) is as current as the day you die (Cairo), and so is every other moment of your life. If you had a machine that could transport you, you could travel back and forth between moments, and each and every one would be “now” for you. There is no logical reason (other than our subject “feeling”) that any one moment in your life is more current or “valid” than any other. Every moment you live feels to you at that moment as the “real” moment. So let’s say you have that time machine, and now can travel between moments as easily as you can travel between places. And let’s also say, that, like the main character in my book, something terrible happened to your parents when you were five. Can you go “back” in time and save your parents? Let’s say you can. Presto, your parents live, and nothing traumatizing happens to you. So, if nothing happened, why would you later go back and try to stop it? There would be nothing to stop. So of course you wouldn’t go back, and since you didn’t, who saved your parents? That’s a time paradox, most commonly referred to as “The Grandfather Paradox“. The Eternalism view prevents time travel paradoxes. If all moments in time exist simultaneously, than all moments are happening simultaneously. Right now, you are being born, visiting the dentist for the first time (and every time – scary thought!) attending school, reading this blog, and dying. Everything that has or will happen to you is happening to you now. We can only experience one single second of it, but just like Paris is existing through we can’t see it, the past and future is happening, although we can’t experience it. 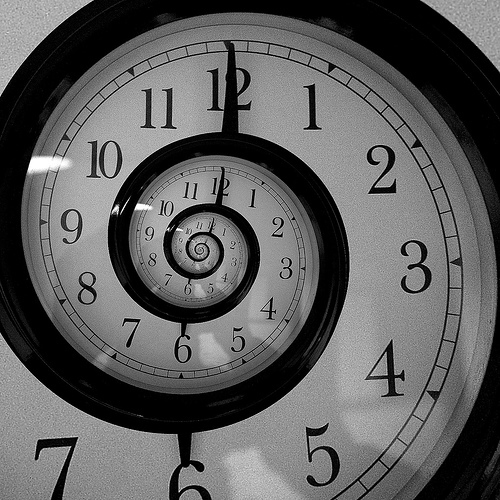 And because time is happening all at once, all of our decisions, all of our free will, is happening all at once, too. We are deciding to run that red light three years ago. We are deciding to continue reading this blog (or not!). We are attending the Olympics in 2014. We are putting on the socks we are wearing tomorrow, and we are going to bed last night. It’s all now. We know our past. We know the date we were born, we know the things we remember really happened. We don’t fear that suddenly the facts of our lives will scramble, that suddenly instead of going to public school, we’ll be homeschooled, or that we’ll suddenly own a dog instead of a cat. The past doesn’t change. However much we wish we could go back and erase that time we embarrassed ourselves in public, it’s never erased. It always happens, because it did happen. If Eternalism is correct, what we call the “future” works the same. What “will” happen, has happened – it’s just that the “you” reading this blog doesn’t remember it, because that “you” is always trapped in the moment you’re living. The future only seems full of endless possibility because you can’t see it, or remember the decisions you’re going to make. You can tell yourself that you could win the lottery tomorrow, and find that a comforting thought, but in reality, you have already either won or lost. I think that’s why we were created not to able to remember the future as we do the past – if we knew the entirety of our lives from beginning to end, how could we have any drive to live them? Knowing how we either succeed or fail would mean that we wouldn’t take the chances that would create that success or dare the risks that sometimes lead to failure. And that, folks, could create a whole SLEW of paradoxes. Time only works if we have this linear impression of it, of time “passing” from past to future. Everything that has happened, or will happen, is happening. You can’t go back and kill Hitler before he killed anyone, because those people did die. You can’t go forward and kill (unknown horrible person) before (unknown horrible thing happens) because that horrible person is already alive and because that horrible thing is already happening. On the other hand, it’s possible you did go back and kill Richard Snodgrass Baudelaire’s mother, before he could be born, grow up, and kill fifteen innocent people. Who’s Richard Snodgrass Baudelaire, and who are the people he would have killed? Since you killed his mother before he could be born, we’ll never know. He never existed, he never happened. There’s only one way history – either of the “past” or the “future” – can be affected, and that’s through your normal everyday decisions.